Shiver me timbers, it be International Talk Like a Pirate Day! Arrr, here at findmypast.com.au we be channelling our inner swashbuckling buccaneer by scouring for gems among one of our newest collections: Irish historical newspaper arrrticles from 1820 to 1926. In parrrrticular, we were curious about pirate women. 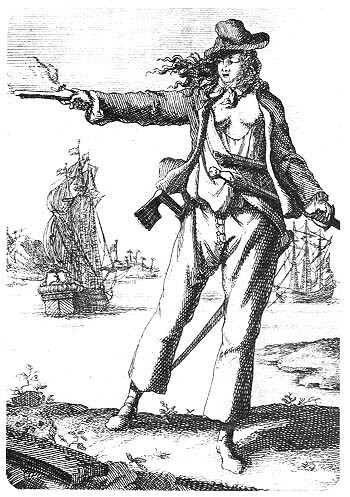 Though female pirates such as Anne Bonny (pictured) were not unheard of in the 17th and 18th centuries, we wondered - what about the 20th century? We found an example of a 1920s ‘piratess’ while exploring findmypast’s new Irish newspapers collection from 1820 to 1926, launched earlier this week. Among the 2 million historical Irish newspaper arrrrrticles now available on findmypast, our swashbuckling femme fatale appeared in the Cork Examiner from 9 February 1923. It reported that a group of pirates that attacked the Sui-An steamer in Hong Kong was in fact led by a woman – and, to the journalist’s clear surprise, a well-dressed and well-read woman at that! This unlikely “leader of the river pirates” was described as being “smartly dressed, wearing black patent leather shoes, white silk stockings, a fine serge skirt, and a Japanese fox fur”. Indeed, she was reportedly a graduate of an American university. Avast! Ye clearly can’t judge a pirate by its clothing. And neither, it appears, can you judge a newspaper's coverage solely by its location. This article is a reminder of how exciting and informative historical newspapers can be for genealogy and family history research - including those from surprisingly distant locations. Afterrrr all, this Cork newspaper article, about a pirate attack in Hong Kong, came by way of Vancouver. Much like today, historical newspapers frequently reported events from around the world, meaning that a newsworthy account of your ancestor – swashbuckling or not – may turn up in a seemingly random publication from a distant continent. Countless treasures of insight about your family tree may just await discovery in historical newspapers, even beyond your ancestors' own countries or continents. Searrrrch fer yer ancestors in the Irish Newspapers Collection today, me heartys!